« Day 161.5 in Beijing: Day 2 of R2D2 Air Filter. Day 162 in Beijing: Brother, Can You Spare A Ringgit? 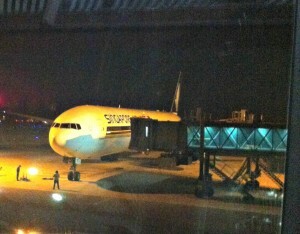 Singapore Airlines. We can not thank them enough! Excuse the paraphrase in the title. However, it is very apropos to Malaysia and the people we have met. We have been dumbfounded, and amazed, by the generosity of people that live in Johor and Singapore. This is, in no way, stating that the people in China have been any less generous with us. We are just limited in our experiences with them because of our lack of a common language so we probably miss opportunities that we were able to have on our trip abroad. Let me just say that upon our arrival, we probably did the worst job of being a “smart tourist” and having things set up to make our trip easy. We did book our hotel and figure out sites to see but that was about it. 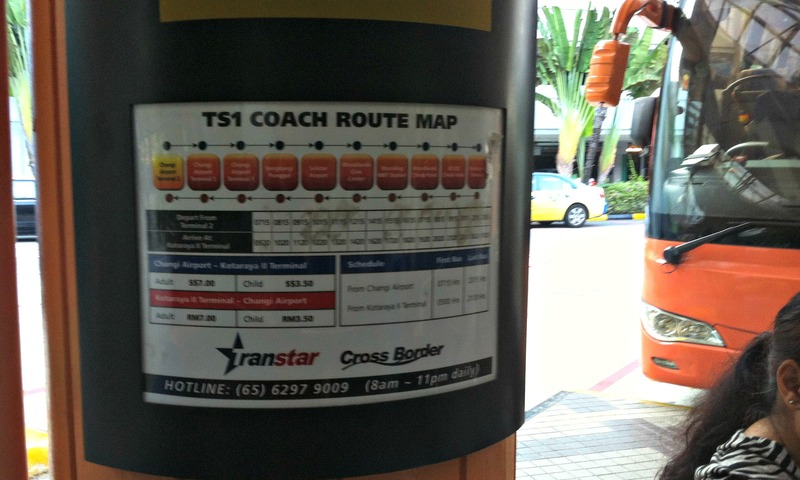 We had checked some bus schedules, from Singapore to Johor Bahru, but we didn’t really plan other stuff out. We just wanted to fly in, relax, and see what happened. So, we changed a bit of money at the airport and tried to find the bus that would take us over to JB at the scheduled time of 7:15 am. We found out, very quickly, that the bus now left at 9 am and that we would be sitting around for a while. Singapore Airport. Utterly gorgeous. They even have slides from one level to another! So we did. We sat. We people watched. We hung out and relaxed. Mission accomplished. As the bus arrived, we hopped on and took our seats. The bus was very comfortable and very clean. It cost us about 5 bucks each for a 2 hour bus ride..with a lot of “attractions” which I will detail below. As we rode, we started having a conversation with another couple on the bus. They were obviously Muslim from their dress and incredibly kind. Mahadi works for the airlines and had just gotten off work. His wife, Yati, had joined him so that they could go up to Kuala Lumpur for their 25th anniversary weekend. They seriously looked about 20 years old so when they said they had 3 kids, one of which is grown, we couldn’t believe it. They seemed so happy and full of joy that it must keep them young. A good lesson to learn. As we rode the bus we talked about life, experiences and travels. 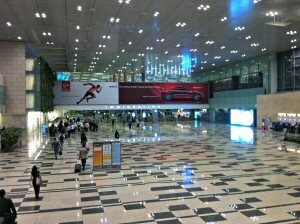 We arrived at the Singapore Customs Exit station, since we were taking the bus to Malaysia, and they told us what to do. This is where the bus gets fun. The bus stops and information. We had to depart, run to the customs agent (as they did also since they are Malaysian) and then run back to find our bus. If we had missed it, we would have had to try to get on another bus. As we entered, they checked our tickets again and waved us in. We then crossed the bridge from Singapore to Malaysia and had to do the exact same operation again. This time, we DID miss our bus! So, Mahadi suggested we take a taxi. 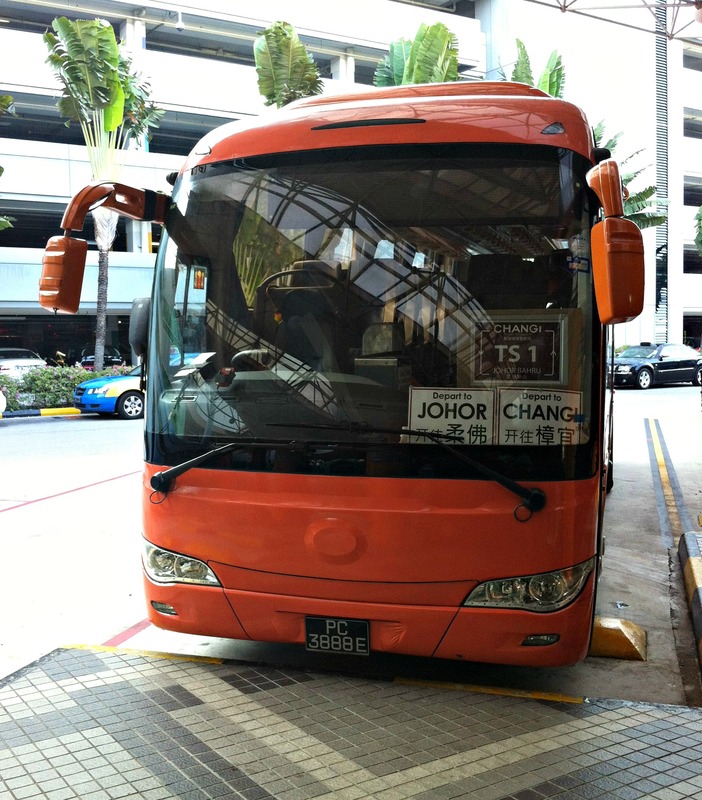 The bus from Singapore to Johor. We had only a bit of money left and had no idea how to bargain or what was a fair price. Mahadi started bargaining with the drivers and got us a very fair price of 20RM (Ringgit Malaysian). We started to get in, but the driver stopped us. Mahadi and Yati decided to go with us, then continue on, after we were dropped off safely, to the bus station that would take them to Kuala Lumpur. As I tried to get in the bus, the driver motioned for me to stop and waved Jill in to the back of the minivan. Yati also sat in the back. Then the driver had Mahadi and me sit in the middle row seats. I have to admit, I felt fairly awkward as this is brought up some feelings of cultural differences which would have upset me if we were back in America. However, Jill and I have been in Muslim countries before and this is how it goes. Jill understood this and accepted it also. It is not our place to question others when in their country. Finally, we offered to take them to dinner when they returned and exchanged information. We walked into the hotel lobby feeling thankful, overwhelmed, and joyous to be on vacation. Sadly, we weren’t able to meet up with them because of our schedules but we have kept in touch and will take them to dinner when we go back for the Winter holidays and New Year’s Eve.